State Highway 48 is shown Monday along the Bahia Grande near Brownsville. The Port of Brownsville and the U.S. Fish and Wildlife Service are working toward creating a wildlife corridor that would create a link between Boca Chica and the Laguna Atascosa National Wildlife Refuge, providing a safe passage for animals, especially threatened species. 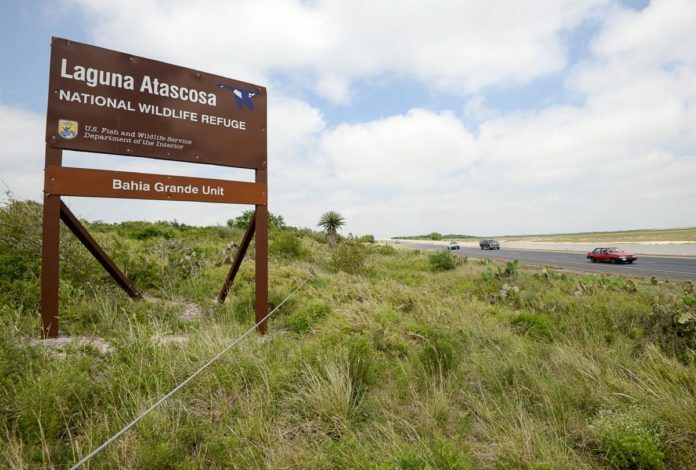 HARLINGEN — Hunters seeking permits for emergency hunts targeting exotic species at Laguna Atascosa National Wildlife Refuge have swamped the refuge’s plans, and a lottery will be held. The statement on Facebook said hunt permits will be allocated via a lottery. Previously, the refuge said the dates for the hunts will be April 7 and 8, and then again April 14 and 15. The refuge said it will issue 40 permits for each hunt at $60 each, and each hunter will be allowed to buy one permit. To apply for a permit and qualify for the drawing, hunters or a representative must drop off applications in person at the refuge between 8 and 11 a.m. March 5. Refuge officials said no applications will be accepted via mail, fax or email. Applicants can choose to wait for the drawing, which will take place at 11:30 a.m. March 5 at the refuge headquarters, but applicants are not required to be present to win a permit. Those awarded a permit will be required to pay for it with cash by 3 p.m. March 7. For more information, call the refuge at (956) 748-3607, ext. 105.